Better economic times and, thankfully, an end to the ridiculous federal government shutdown, boosted attendance at this year’s annual meeting of the Geological Society of America in Denver to well over 8,000. We had a great time celebrating GSA's 125th anniversary. We met passionate geology professors and students and hard-working researchers and professionals, and we visited with old friends like Callan Bentley. We now have nearly 170 Emriver models worldwide, and we were happy to see many Emriver owners in Denver. We saw the effects of the recent floods first-hand (an important issue for us), and talked with scientists and residents in the area about what happened and how to rebuild. 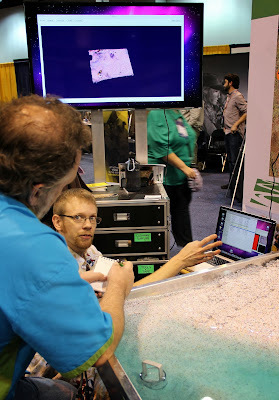 of the Kinect sensor to measure geomorphic change in his Emriver Em2 model, Matt demonstrated digital 3D modeling with the Kinect in our models. Matt also brought along his famous high speed camera and captured some cool video of water and particle movement in our Emflume1. Many thanks to Matt for his interest in our models and for putting them to such good scientific use! This year's GSA was the first conference for our new colleague Anna Durrett, and, as we expected, she did a wonderful job. Anna also handled much of the complex logistics. Thanks Anna! Thanks also to students who helped in our booth—Bo Cherry, an IGERT fellow at SIUC, and Candice Passehl, Nora Dwyer, Sara Holden, Kyle Lewis and Catherine Vogel, students at Fort Lewis College in Durango, Colo.—we couldn't have done it without them! Steve, Alee, Nathan and Anna after a successful meeting! GSA 2013 move out from Steve Gough on Vimeo.